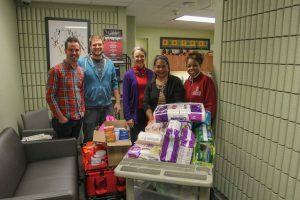 The Office of Diversity and Inclusion at the Sam M. Walton College of Business and University of Arkansas students from the Commonwealth of Dominica collected non-perishable items for Dominicans affected by Hurricane Maria that directly hit the island Sept. 18. Collection efforts were coordinated with Rockhouse Church in Fayetteville, which will deliver the items to the Dominica Houston Association in Texas. The association will transport supplies to the Dominican Republic within the coming weeks. Items collected were food, personal hygiene items, items for infants and toddlers and household products. The collection project hopes to show support to students whose family and friends were affected by Hurricane Maria and to fill gaps in global relief efforts. Dominica is a sovereign island country located in the Caribbean, south of Puerto Rico and north of Venezuela. The island took a direct hit from Hurricane Maria, a category 5 storm, which devastated the country. The University of Arkansas has 11 students from the tiny island. The mission of Walton’s Office of Diversity and Inclusion is to support, advocate and assist the Walton College in developing plans for diversity throughout the college. It is committed to increasing students’ awareness and value of diversity and to providing resources and support to Walton College students.